Thanks to Wales’ famed all-male choir Only Men Aloud, two of the US superstar’s songs have been given a choral makeover to celebrate the singer's imminent show at the Principality Stadium. Bieber will perform in front of thousands in Cardiff on June 30 as part of his Purpose World Tour, but in advance of his arrival OMA popped in to the stadium to record two special renditions of the performer’s huge hits Love Yourself – sung completely in Welsh – and Sorry ahead of the pop star performing in the city. The Welsh men’s choir who rose to prominence after winning the BBC’s Last Choir Standing talent show, filmed their own unique take on Justin Bieber’s songs in the Welsh Home Team dressing room, which will be the star’s dressing room when he performs later this month. 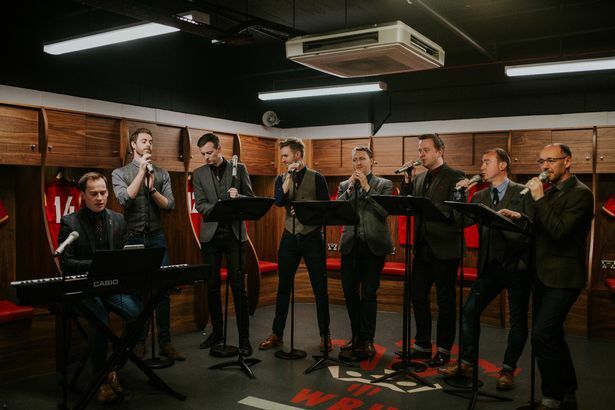 “Of all of the projects we’ve been involved in, we weren’t expecting to be asked to arrange, learn and perform two Justin Bieber songs,” said Only Men Aloud’s Craig Yates. “We’ve had great fun singing them, especially singing one of them in Welsh.